Tortelloni are stuffed pasta prepared by shaping the pasta dough into a circle or a square, and then stuffing it with a filling that is usually made up of ricotta cheese, herbs and leafy vegetables such as spinach. They are usually served either with ragù or with a simple sauce made of melted butter and sage leaves. As usual, I took the easy way out and made use of the store-bought ones. For those of you interested, this post explains how to make tortelloni from scratch. Bring a pot of salted water to a boil, add the tortelloni, and cook according to the package instructions. Drain well after reserving a cup of the pasta water and return to the pot. In a pan, heat the olive oil over medium heat. Add the minced garlic and shallots and sauté for about 2 minutes. Add the tomatoes, salt and the chipotle pepper along with the sauce. Cook until the tomatoes are soft. Add the ricotta cheese to the pan and mix well to make a creamy tomato sauce. Add the sauce to the cooked tortelloni . Toss to combine. Add the reserved pasta water to thin out the sauce if required. Squeeze the juice of half a lemon over the tortelloni and garnish with chives. Serve hot. This goes to Kevin @ Closet Cooking who is guest hosting Ruth's Presto Pasta Night this week. I'm also sending this to Archana @ Archana's Kitchen for her "One Dish Meal" event. mmm... love tortellini ... lovely picture! Bring on the heat. Yes, please. And thank you. WOW this is my fav, love tortellini. I must say wonderful recipe and taste great with chipotle pepper. Thanxxx for sharing!!! You do make wonderful array of food. I buy store-bought too.. with spinach or mushroom filling. I've always made a butter-garlic sauce. This sauce looks delicious. I'm a big fan of creamy tomato sauce right along with pesto. this is one pasta i havent tried..looks so tempting and good...love the shapes of tortelini's...Thanks for sharing the recipe!!! Oh God this is too delicious.I love the filling. It is a great combo. Very delicious! I have made stuffed pasta but never this one. Tortelloni looks yummy, I only wish I can find the vegetarian ones with spinach in stores here. Most of the time, in stores like Trder Joes etc. I only find meat based tortelloni. I just love any kind of pasta! the tortelloni looks so delicious and inviting! Yummy. Yum, my kids would love it. I love tortellonis as well..but the cheese and the garlic filling...I'm trying your version the next time..
Looks good! 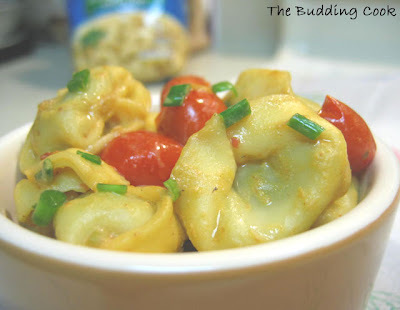 Store bought tortellini is great for making quick and tasty pasta dishes! Raaga- now that's something you'll never catch me doing;-) I'm too lazy to put in all that effort. So, you make it from scratch too, huh? I've had raviloi (which is very similar to this) with butter and it does taste really good! Why do u buy the store-bought ones? I know u make your own ravioli, so this one's almost like that, na? Sunshinemom- you're another one of those who makes it from scratch! Wow! Rachel- Wow! you attended a class for that? So making it is not as easy as it looks, huh? lovely pasta, I am a huge fan of all kinds. great pic. By the way, round-up for T&T May is up now. Hope you re ready for the June challenge. Great dish. I always love a new spin on an old favorite. Thanks for sharing with Presto Pasta Nights.